Last week, it was reported that an exploit was being used to spread the ROKRAT malware. What made this so interesting is that Flash was being used by an APT group after what seems like a period of absence. We couldn’t help wonder what had changed and just how this latest exploit worked. In this post we will walk through a traditional Flash exploit, and look to understand just how this latest sample works to bypass some of the hardening introduced in the Flash environment. Let’s begin by taking a look at an exploit that had a role to play in some of the latest Flash mitigations, CVE-2015-5119, commonly known as the HackingTeam Flash 0day. Back in July 2015, Hacking Team experienced a breach in which a number of internal emails, application source code and exploits were released into the wild. 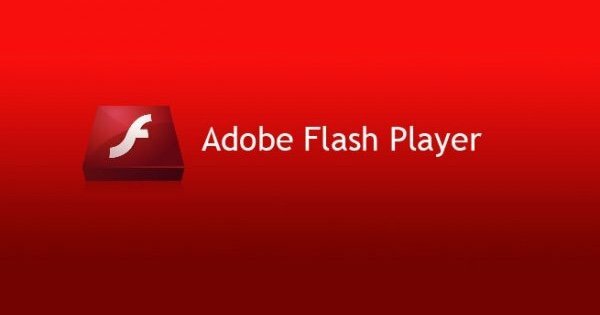 Included in the leak was an exploit for what would become known as CVE-2015-5119, a remote code execution flaw in Flash 16. 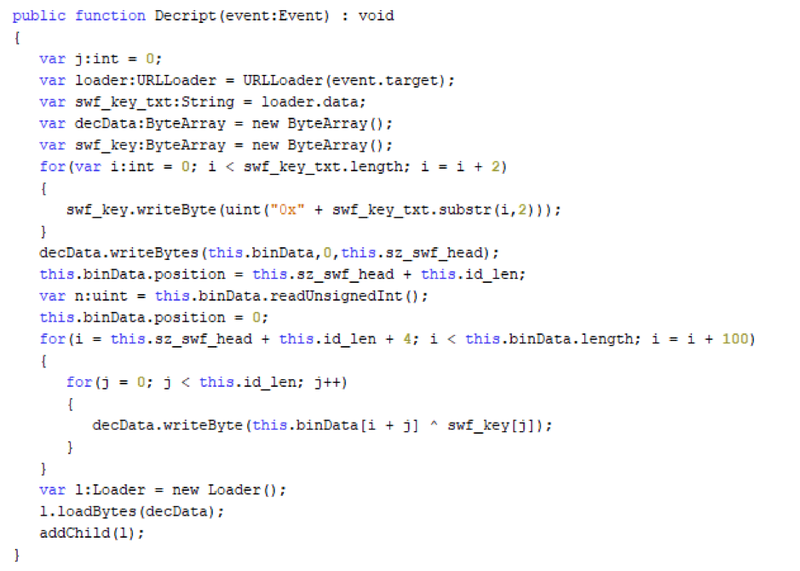 Compiling this ActionScript code, and execute the SWF using Flash version 16.0.0.287, we find that the _ba ByteArray ends up pointing to free’d memory. // TODO optimize the code below. It is within the “valueOf” function that we force our ByteArray to be reallocated, however the Flash pointer “m_byteArray” is never updated, meaning that after “valueOf” is called and memory is reallocated, “m_byteArray” becomes a dangling pointer. Now that we understand the vulnerability, let’s take a look at just how this was exploited. Now, if we are in a position to corrupt the “Length” property, what we find is that we have a pretty strong R/W primitive. For example, if we were to populate the memory holding the “Length” property with 0xFFFFFFFF, we would be in a position to manipulate arbitrary memory. Let’s update the exploit to show this in action. A new ByteArray (ba) is created and assigned a length of 0xfa0. A value is assigned to offset 3 of the ByteArray, which causes the “valueOf” method to be invoked. The “valueOf” method changes the size of the ByteArray, forcing a reallocation of memory, but leaving “ba” pointing to the original allocation. 0x40 is returned, causing the “ba” pointer (which is now pointing to a <uint> to update the “length” property to 0x40003F0. The corrupted <uint> is found in memory by checking for any “length” property which is not the original 0x3f0 bytes. This results in the ability to read/write memory arbitrarily, giving the user the ability to write shellcode and force it’s execution. Of the 3 mitigations, we see that the above technique of corrupting the length property of a Vector.<uint> has been mitigated in 2 ways. First, Vectors were moved to a separate area of memory, isolated from any potential overflows which may allow tampering with the “length” property. Secondly, a number of checks were introduced into the Vector object to ensure that if the “length” property was corrupted, the runtime would detect this corruption and halt execution. This length validation method was implemented as an XOR key. Similar to stack-canaries, a number of attractive properties from the Vector object were XOR’d with a key, and the resulting value stored, allowing a simple way to detect a corrupted value. After the mitigations were introduced, things seemed to quiet down. Then, a new vulnerability surfaced, CVE-2018-4878. The details of the vulnerability were kept quiet, so like many security researchers, we grabbed a copy of the malware and began to reverse engineer the sample. Unfortunately, this is where things came to a halt. All of the samples we analysed contained C2 servers which were no longer accessible, meaning that we were unable to recover the 100 byte XOR decryption key to analyse the exploit. Additionally, those lucky enough to hold the decryption key were not too forthcoming with sharing, meaning all we could do was wait until the details were disclosed. Slowly details did start to become available, in the form of redacted, partial screenshots and posts focusing on the flaw without showing the path of gaining a R/W primitive. After a few late nights, we were able to recreate the vulnerability and understand just what was happening to bypass the introduced hardening. The flaw here exists within the DRMManager’s “initialize” call, which is expecting an object implementing the DRMOperationCompleteListener interface. Before this can be used, the object is free’d by setting “this.listener” to NULL, forcing the allocated memory to be released by the garbage collector. Next we are allocating a further DRMOperationCompleteListener object and holding a reference to this within the “danglingpointer” variable. It is this object that is free’d, however the “danglingpointer” variable still references this memory, meaning that we have a use-after-free condition. This timer is used to check at periodic intervals if our “danglingpointer” object has been free’d, and is now pointing to free’d memory. Eventually this is the case, which allows us to populate this free space with another object. At this point, things get a little hazy. Of the screenshots and samples we found available, none appeared to share the details of the class used to generate the object populating this memory (specifically the “Mem_Arr” class). We did however find a way to exploit the vulnerability, recreating what we believed this class was doing, however if you have a copy of the malware, we would be interested to see just how close we were in matching the malware’s exploit. The reason for this is to ensure that both “MyListener” and “Mem_Arr” objects are similar in size, allowing us to replace the free’d “MyListener” object memory with a “Mem_Arr”. Whilst this may just look like a random sequence of DWORD’s at first, let’s actually look at what we have. First, we see a value of “0x31“, which is actually the “position” property value that we updated the ByteArray/Mem_Arr object to. One of these properties is “m_position” which holds the “position” property. This means we are on the right track, and now have the ability to manipulate the underlying memory of a ByteArray. Here we see one of the mitigations introduced in the Google Project Zero post, a number of properties which are used as XOR check values. We need a way to access this structure by dereferencing the m_buffer address. So here we have the ability to modify the underlying memory of the “Buffer” object. Interestingly, we also see here that we can recover the XOR key via the “check_copyOnWrite” value which is 0 ^ KEY, so in this case we know that our XOR key is actually b179ed8b. And that’s it… when triggered, the Buffer length is set to 0xFFFFFFFF, base address is set to 0x00000000, and the security checks are updated. Source code for the exploit can be found on the MDSec ActiveBreach github. Whilst recreating the above vulnerability, we actually came across another interesting way to manipulate memory contents without having to use a ByteArray or Vector.<uint> and having to deal with the XOR protection. By leveraging object references, like that used above to read the “m_buffer” property, we actually have a pretty stable R/W primitive. Here we can see that using this object dereference, we can overwrite any memory location with a value of our choosing. Again, we do not have access to the full malware sample, but we would be interested to know if this technique was used by the original exploit. In our next post we will be looking at how you can use the above primitive to launch custom shellcode. So what is the takeaway from all this? 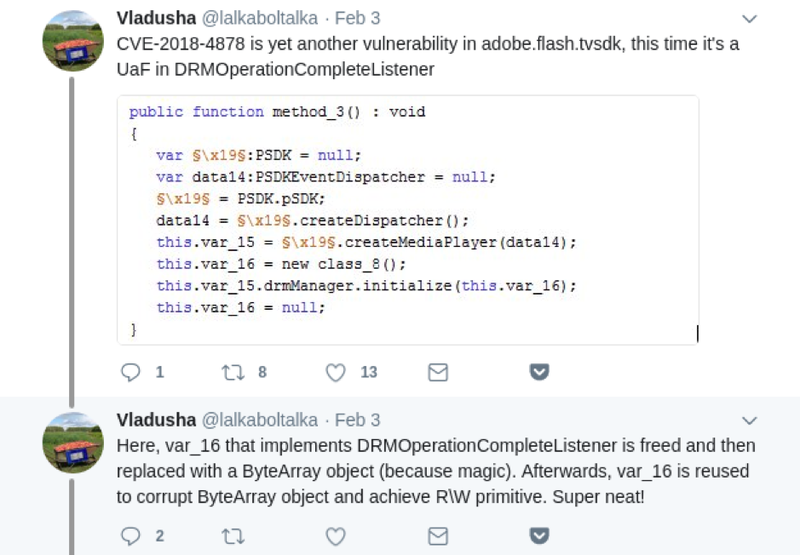 Well the first is that Flash exploitation can still operate in place of hardening added by Adobe, especially in instances such as a Use-After-Free, where we have total control over property values and are in a position to leak memory. Secondly, there are multiple ways to manipulate arbitrary memory in Flash when you have the ability to corrupt objects, although hardening has been introduced in areas such as Vector.<uint> and ByteArray, Object dereferencing can be just as useful. This blog post and research was completed by Adam Chester of MDSec.